A verdict of accidental death has been recorded at an inquest into the death of Holby City actress Laura Sadler. No relatives or media attended the hearing at West London Coroner's Court on 27 August. Sadler died four days after falling from the balcony of her boyfriend George Calil's flat in Holland Park, west London. Police have said Mr Calil will not face any charges. A spokesman for Hammersmith and Fulham Council, speaking on behalf of the coroner's office, said written evidence from Mr Calil given to the coroner included details that the couple had been drinking shortly before the accident. They had consumed "a lot of vodka and wine" and Ms Sadler had been up watching the sun rise at 0600 when the accident happened on 14 June. She had fallen from the balcony of the flat, suffering severe facial injuries and massive head injuries. A verdict of accidental death was recorded by deputy coroner Elizabeth Pygott. The council spokesman said evidence given at an earlier inquest hearing on 23 June - also not attended by any press - included a toxicology report. This showed that there were derivatives of cocaine and traces of diazepam and a large amount of alcohol in Ms Sadler's body. The spokesman said there was no suggestion that the hearings had been held "in secret" as some reports had suggested. In the second instance, the coroner's officer on duty had simply forgotten to alert journalists. "Because the parents wanted it (dealt with) quickly and sensitively, and there were no witnesses, it was possible to slip this one in," he said. The Home Office, which licences coroners' courts, said under policy guidance the local media was normally informed about inquests "where possible". A spokesman said this was not a legal requirement but an informal arrangement in the spirit of media relations. However, one news agency which covers the court, Fleetline News Service, said it regularly contacted the court but was not informed the hearing was on the list. When contacted by BBC News Online, West London Coroner's Court in Fulham referred calls to the local council. No comment was forthcoming from Ms Sadler's agent or the BBC. 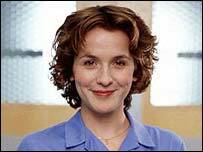 Ms Sadler's farewell TV appearance as nurse Sandy Harper was watched by millions of fans on Tuesday.